Is Kejriwal emulating Advani’s Yatra stunt? With the month of April coming closer, the battle to 7 RCR has heated up. BJP and Congress have played their cards already and are putting in all those efforts to claim majority in the lower house of the parliament. Meanwhile, the new entrant into the political scenario, the Aam Aadmi Party, are trying their best to gain some good ground, if at all they want to give some stiff challenge to the old political power houses in BJP and Congress. The party’s National convener, Arvind Kejriwal, might be avoiding a direct clash with BJP’s lead star Narendra Modi, but he understands the importance of Uttar Pradesh in the politics of the Lok Sabha. The former IRS officer has shown his political prowess in the Delhi Legislative Assembly polls and is all set to contribute to his party’s success on the National Level. But a random thought ran across my might which made me think of some similarities between the AAP and the BJP of the 90’s. With God’s grace my historical knowledge is not as good as some political leaders, but what history tells us of the (in)famous Rath Yatras of Sh LK Advani ( now a sidelined leader at BJP) that the initial yatras brought the BJP to rise in ranks at the national level, gaining exponentially on the account of Ram mandir. Kejri Babu is in similar sort of terms as was Advani in 92. 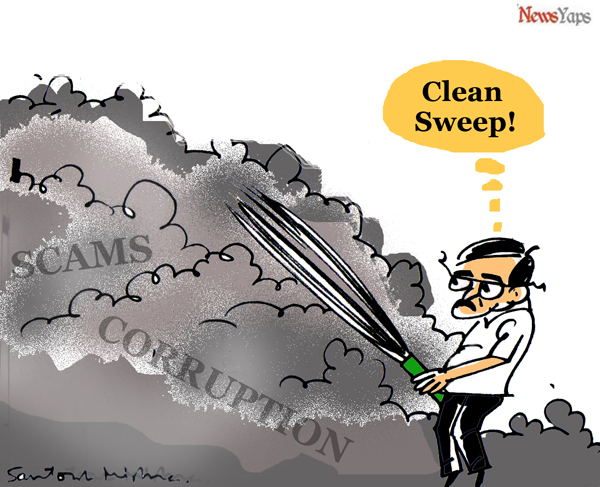 He has come up with the ‘Jhadoo Chalao Yatra'( Cleaning Up with the BROOM) through UP and other states. Despite this striking similarity, the agenda has been totally different, that of AAP against the BJP. Now what is the outcome of this cleaning up campaign lies in the hands of future and more in the hands of the people who vote this 2014. It would be interesting to see the prospects of the broom cleaning up the Hand or slashing the lotus. Post Script : I so not support any political groups(s) and am NOT paid for writing this piece by any person(s). This is my sole opinion and yours need not be the same. So just don’t hurl abuses. Keep your word, it will be treated with respect and in return I demand for respect to my words.